"Pictures or it didn't happen," they said. - Blather. Rants. Repeat. "Pictures or it didn't happen," they said. Oh, it did. Trust us. And here's some proof. The 55-year-old electric cooktop. Everything but the hummingbird feeder's being replaced. Front left burner's been dead for more than a year; front right one, dead for so long we didn't even try re-inserting it. The two back ones work, but note the set screws drilled into the metal to keep them that way. It all goes; the replacement's in the dining room awaiting the suitable countertop hole for it. 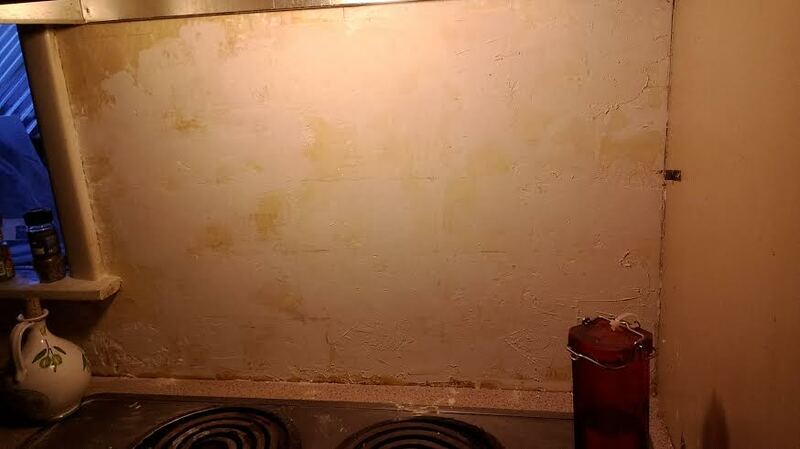 Below, the original stuck-on tile. (That'll stay, being behind the fridge and all.) Above, the wall mostly cleared of the adhesive residue; this involves a small hammer, a pair of chisels, and much cursing. In between, and in the spot above and below the wall outlet, you can see what the residue looked like when the tile was peeled off. Some required little prodding at all; some seemed resistant to nuclear weapons. But we're down to single digits of squares left to be cleared. THAT's how. (Let the record show she asked me to take that picture.) 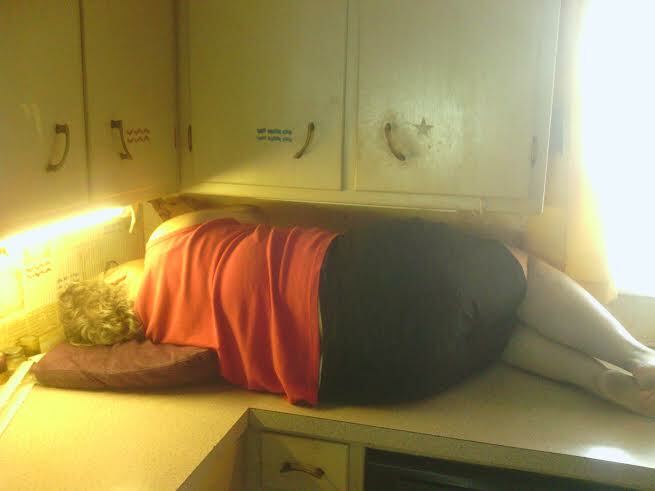 I came home on a weekend morning to find Eleanor in that spot. She got out everything in front of her; I later cleared the wall above and to the left of her head. 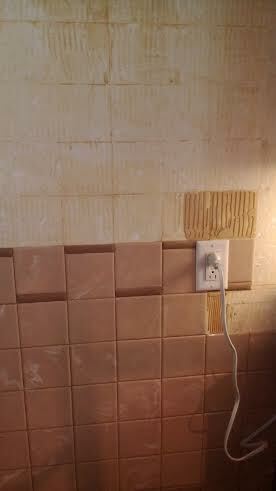 It's going to get a much thicker, prettier, permanent tiling over it. Except for the final few to the left of that shot, it's all gone- the adhesive, the designs, everything. Plenty of pockmarks, but that stuff got plenty grimy in the intervening years (the wall behind that switchplate was covered in pet hair), and the new tile will be a much more resistant surface. * And somewhere in all that, we'll find the hammer which disappeared a week ago and was probably used to murder Jimmy Hoffa, Junior. 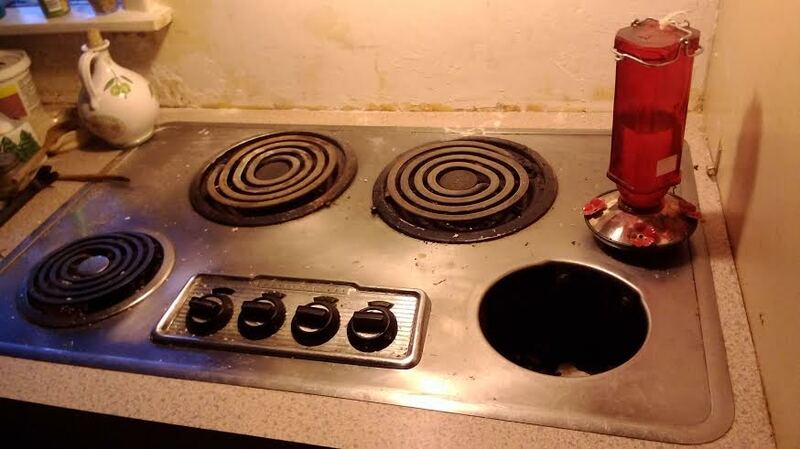 I can see why you guys are so gung-ho about changing out that cooktop. It would drive me nuts too! Your kitchen renos will end up with it being such a lovely looking space at the end! 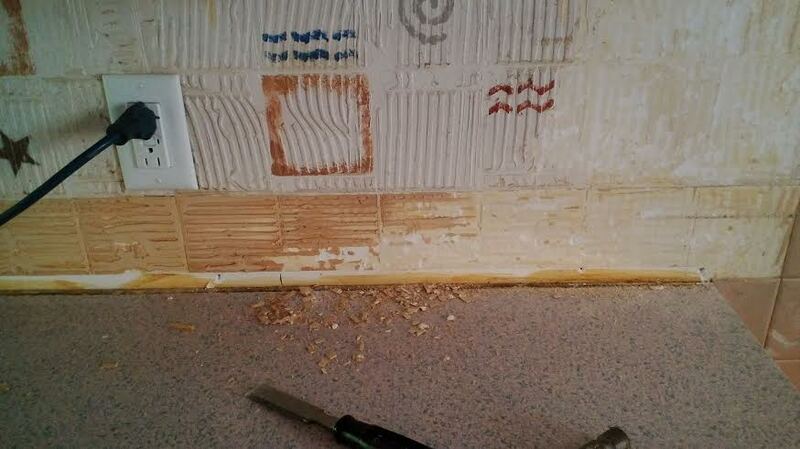 I really don't envy you removing that grout, though! I was coping pretty well with the cooktop, but as Ray said, better to replace it now, while it still sorta works. Also, I hope we'll add some equity to this house by doing all this. What Ray left out about the adhesive removal is that I crawled up on the counter in order to save my sketchy rotator cuff. Doing that kind of work at arm's length is just too hard on the shoulder. Thanks for the compliment. I get giddy at times, the changes are so drastic. Wow. What masterpieces will E make now??? Can't wait to see the finished products. And what a gorgeous little man. Aww, thanks. Ray left out that I'm going to strip, stain, and reseal just the cabinet doors and drawer fronts, so it'll be a while yet before it's done. You're braver than I am. Also more skilled.